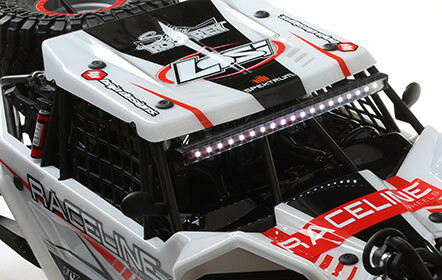 Go BIG everywhere with the 1/6 scale Losi Super Rock Rey AVC 4WD RTR! This ready-to-run gives any driver the power and stability to succeed off-road with impressive size, speed, and endurance. 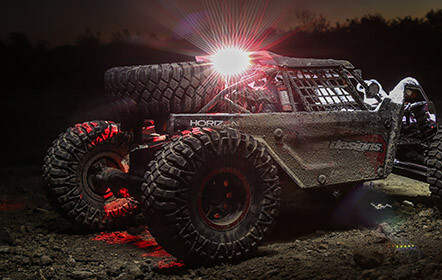 Go BIG wherever you bash with the 1/6 scale Losi® Super Rock Rey® AVC® 4WD! This ready-to-run gives any driver the power and stability to succeed off the beaten path — and to dominate the desert with impressive size, speed, and endurance. The Super Rock Rey® takes its inspiration from full-scale rigs that tackle the King of Hammers and similar places others won’t dare go. 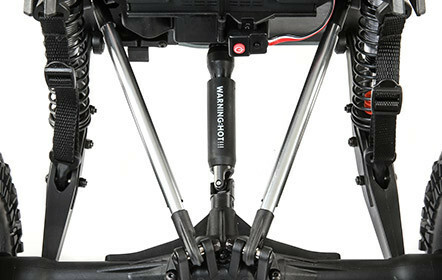 Realistic solid axle performance joins 8S brushless power that pushes the needle to 50+ mph or more — while the stability of AVC® technology lets you hold nothing back through corners and jumps. Over rough terrain, slick surfaces, and loose dirt, you’ll have full-throttle freedom no matter how the environment fights back. Dependable Spektrum™ DSMR® technology delivers precise control. 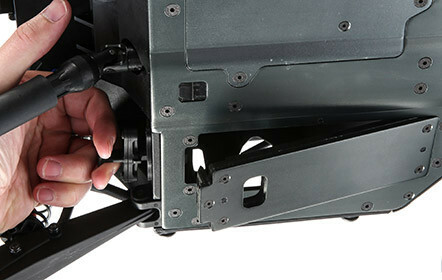 Through it all, the bottom-loading battery enables fast pack changes without body removal. The large tires and new front end geometry increase suspension travel and improve performance over any terrain. Super Rock Rey loves rocky off-road tracks, and the rougher, the better! 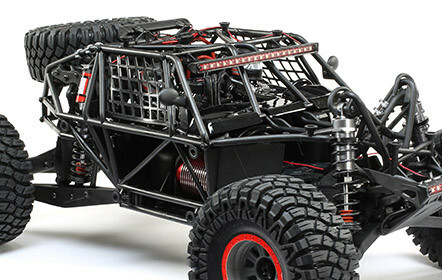 It also rips through sand, mud, water, and most any other surface condition — with a new roll cage and body work creating the dirt-spitting image of 1:1 desert racing, rock crawling, off-road action. The Super Rock Rey’s rear suspension allows it to soak up massive whoops and bumps with the same realistic handling and movement of a full-scale desert truck. You get better control and a more locked-in feel regardless of the terrain. The front, independent A-Arm suspension has been carefully engineered letting the Super Rock Rey rip across the terrain with confidence. By having fully independent suspension, it allows each side to react accordingly providing more control and more precise steering and handling. 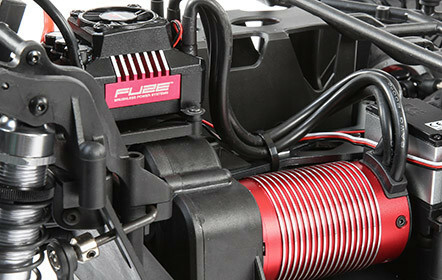 The vehicle comes equipped with a Dynamite® Fuze™ 750Kv brushless motor and a waterproof 160A ESC. This potent combination can handle 8S LiPo batteries (sold separately) and will allow you to hurtle across the landscape at speeds of up to 55+ mph. 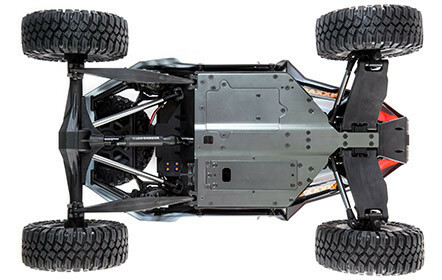 Just like the 1:1 desert trucks, the Super Rock Rey® truck comes with a super-rigid roll cage made of super-tough composite material that enhances the truck’s scale looks and durability. It is integrated with the 4mm hard-anodized aluminum chassis plate providing the ultimate protection for your truck and electronics. The two piece bolt-on body panels give the buggy an authentic factory look. These panels are polycarbonate for incredible durability and rugged good looks. The foundation of the Super Rock Rey consists of a 4mm, hard-anodized aluminum chassis plate with a 4mm upper deck. 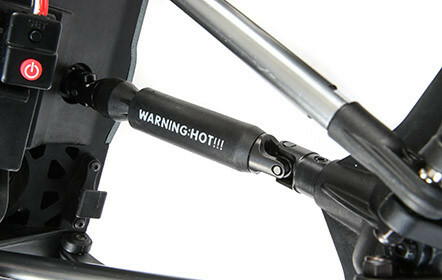 For added durability and performance it’s integrated with a realistic roll cage made of super-tough composite material. 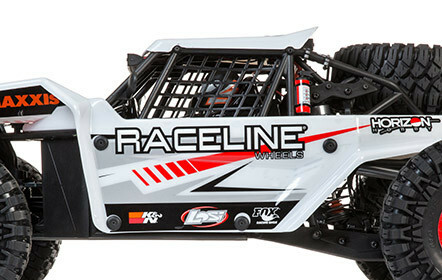 Whether you are hitting the whoops, getting huge air, or just wide open, the 4mm chassis just keeps asking for more! Full-time four-wheel drive provides amazing traction. Additionally the front, center and rear differentials can be tuned allowing adjustment of the power bleed between the front and rear drivetrain. The power bleeds evenly front-to-rear and the truck will drive out of the turns harder from point to point. The tunable differentials allow you to dial in your truck for maximum performance and traction. The fun doesn’t stop even when the sun goes down with the Super Rock Rey. Brilliant LEDs on the two front-mounted integrated light bar cast more than enough illumination for running at night. 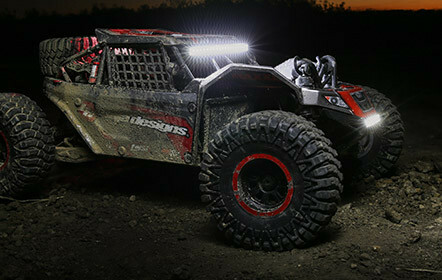 Plus, the roll cage-mounted LEDs place only a small demand on the battery allowing you to stay out all night! 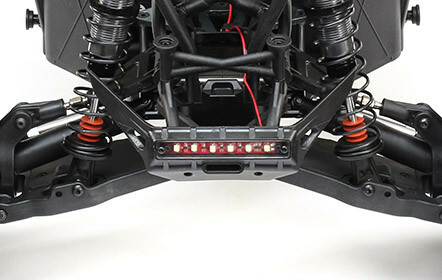 Just as important as the front lights, the red rear lights allow you to gauge the orientation of the buggy even in the darkest night. 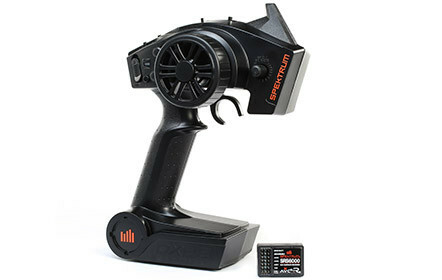 The robust Spektrum™ S904 waterproof digital servo is designed to handle whatever you can throw at it. Monstrous torque delivers the most intense Super Rock Rey® experience possible. To help withstand the trials and tribulations of off-road driving, the Super Rock Rey incorporates our innovative bottom loading battery system, which allows you to change the batteries without removing the body. Quickly and easily make battery changes without removing the body or wrestling with battery straps. Blow out a tire out on the flats? No worries. The fully-functional spare tire not only adds an authentic scale look to the Super Rock Rey®, but serves as a true spare. 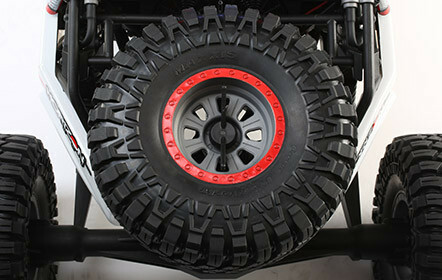 Easily add the tire and get back to tackling the terrain. Looking just like their full-scale counterparts, the Fox Shox reservoirs add to the incredible scale realism of the Super Rock Rey. The Super Rock Rey features several scale details rarely included. 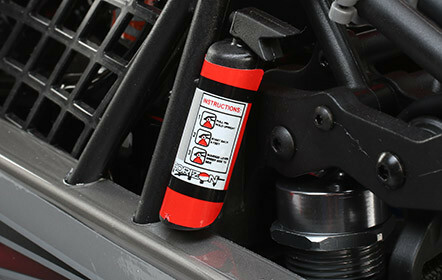 Attached to the outside, the scale fire extinguisher is at the ready and adds to the realism of this desert racer. Scale rear view mirrors on the Super Rock Rey’s doors include high-end details like mirror-like chrome inserts. You can actually see your reflection! 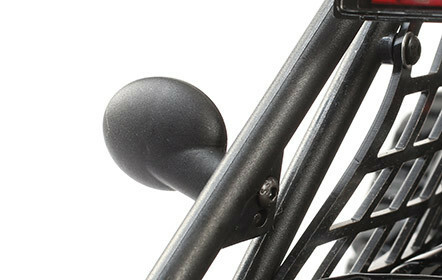 Rubberized safety window netting looks and feels like the full-scale counterpart’s real netting. Everywhere you look, the Super Rock Rey’s scale details set it apart from the competition. 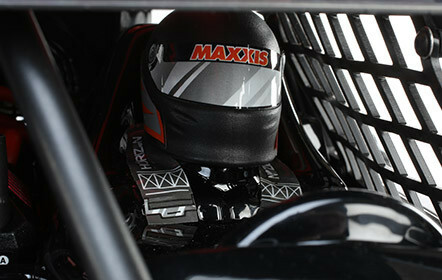 The Super Rock Rey also has a molded interior that includes a driver and co-driver, both of which sport racing helmet and harness details. 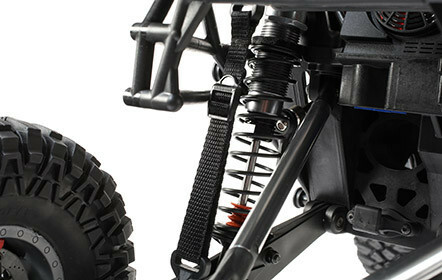 Fully-functional suspension limiting straps look and act just like their real-world counterparts. A buckle allows drivers to adjust the length of the strap. Mounted separately, the authentic looking rotors and calipers add to the incredible scale appearance and keep the realism alive as the Super Rock Rey races over rough terrain. True-to-scale tires look incredible, increase ground clearance to avoid hang-ups, and allow drivers to hit the ground running. 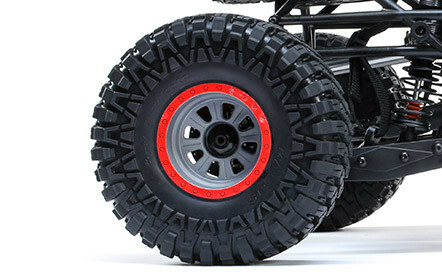 Licensed Raceline Wheels and Baja Designs trim schemes complete the scale details of the Super Rock Rey. These trim schemes will have racers doing double takes as they take on all comers. The receiver's built-in AVC® (Active Vehicle Control®) system works behind the scenes, making hundreds of throttle and steering adjustments per second, so more of the motor's power is translated into ballistic speed and acceleration instead of just flying dirt. 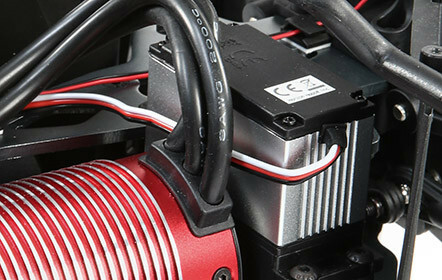 The patent-pending AVC system adds a level of performance that simply cannot be found with any vehicle from any manufacturer other than Horizon Hobby. Like traction control in your full-scale vehicle, you can activate or deactivate the system on the fly and adjust the level of stability based on driving conditions. 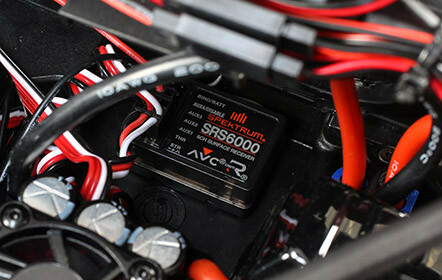 Any RC vehicle can go fast and with AVC you can go faster while maintaining optimum stability in all driving conditions. Adding the optional Spektrum Speedometer allows you to instantly see your vehicle's speed in real time (other items may be required). It also records top speed and features an easy-to-read LED screen (optional accessories required). The Spektrum Dashboard Mobile application allows you to view everything from speed, motor or engine temperature, battery voltage and more. With 50+ mph speed potential, the Losi® Super Rock Rey® AVC® 1/6 4WD RTR easily outperforms the competition. It also has a robust chassis and features AVC stability — making it easier to control for drivers at any experience level. Impressive 1/6 scale size and exceptional scale looks. 55+ mph speed potential to outperform the competition. Supports up to 8S LiPo battery power out of the box. AVC® Active Vehicle Control system to provide the right amount of stability for any driver. 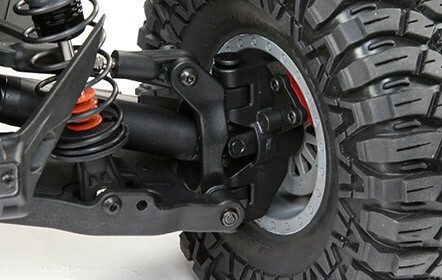 4WD independent front suspension with solid axle 4-link rear adds realism and improves performance over any terrain. 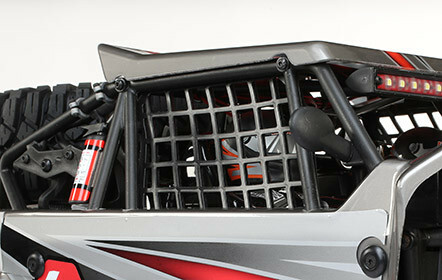 4mm aluminum chassis with injection-molded roll cage provides superior durability and scale looks. Larger wheels and tires increase ground clearance to avoid hang-ups. LED light bars provide scale looks when the sun goes down. All-metal gear drivetrain increases durability. Preset motor plate provides easy, precise gear mesh. 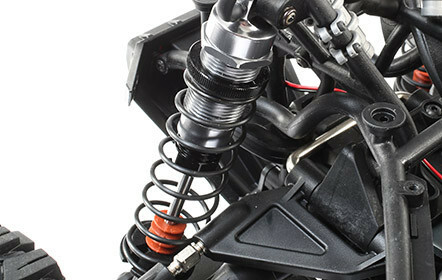 Coil-over, oil-filled shocks keep the ride smooth and plush. 750Kv Dynamite® Brushless Motor and Dynamite Fuze™ 160A Brushless ESC are capable of 8S power and 50+ mph speeds. Waterproof electronics withstand racing over wet and muddy tracks. 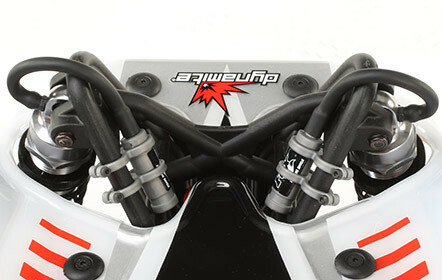 Large-scale, metal gear Spektrum™ steering servo withstands punishing action. Multi-piece body and driver interior maximize scale realism. Bottom-loading battery makes pack changes quick and easy, with the capacity to hold up to 8S packs.